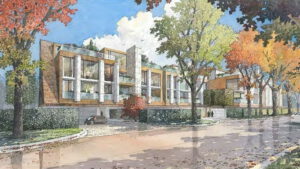 Proposed Development at 5, 7, 9 Dale Avenue | South Rosedale Residents' Assoc | The SRRA is one of Canada’s oldest ratepayer groups. Formally incorporated in 1931, the Association is committed to providing South Rosedale’s residents with a strong voice relative to the area’s unique position as one of Toronto’s most desirable residential communities. A developer is proposing to construct a residential condominium building on the three properties at 5, 7 and 9 Dale Avenue, on the south side of Dale Avenue, east of the Glen Road Footbridge. The proposed development consists of a 4-storey building with a rooftop mechanical level, and 26 residential units with a floor area of approx. 95,000 square feet and 58 underground parking spaces. The South Rosedale Residents’ Association Board is currently considering the proposal and its implications for immediate neighbours and for the neighbourhood as a whole. The Board is gathering input from the community, especially homeowners who live near the proposed development, and is reviewing the City Planning Division’s preliminary report. The City will schedule a community consultation during the fourth quarter of 2016. SRRA will notify members of the meeting via email and web posting. Further information regarding the proposed development can be found here. – Confirmation that the proposed Official Plan Amendment is appropriate and maintains the intent of the Natural Environment policies.